Honeywell has announce a new expanded operating system conversion capability for their CN51 enterprise mobile device. This new software conversion allows customers to purchase devices with an operating system that supports their existing application software, while enabling them to migrate to newer applications in the future to take advantage of the latest system enhancements and preserve their hardware investment. Any CN51 originally shipped from the factory with Windows Embedded Handheld (WEH) 6.5 may be converted in the field to Android by purchasing the CN51 Android Conversion License (P/N 238-000-002), applying the license per the included instructions, and loading the new Android software. The Microsoft WEH 6.5 Certificate of Authenticity (COA) label must be removed from the battery compartment on CN51 devices running Android. It is recommended that the customer retain the COA for possible later reapplication should the device be reverted to WEH 6.5. Android 4.2.2 (“Jelly Bean”) for the Intermec by Honeywell CN51 mobile computer is now released and orderable. In addition, conversion licenses (238-000-002) to convert a CN51 from Windows Embedded Handheld (WEH) 6.5 to Android 4.2.2 in the field are also now released and orderable. The Android 4.2.2 firmware includes Google Mobile Services (GMS), and there is not an option to order these CN51 Android 4.2.2 configurations without GMS. CN51 Android 4.1 configurations are no longer orderable and are not available for new unit shipments. Customers with CN51 Android 4.1 configurations may upgrade their units to Android 4.2.2 in the field free of charge. For assistance finding the right Intermec mobile computer for your needs, contact us at BarcodesInc. 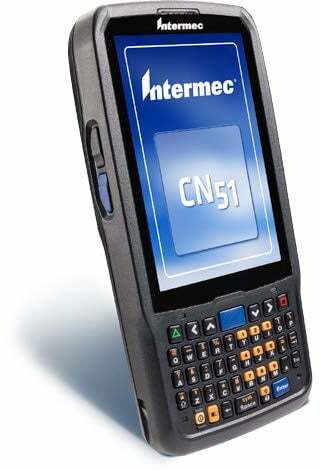 The CN51 (Windows Mobile and Android versions) follows a long heritage of industry firsts for Intermec in the wide area wireless space, with that being the first rugged mobile computer that is dual operating system capable to be certified on all of the major North American wireless carriers. Unlike the performance limitations of smartphones and competing mobile computers, the CN51 is the only rugged yet ergonomic solution with the versatility to support both the Windows Embedded Handheld 6.5 and Android 4.1 operating systems, and deliver the benefits of a rugged solution such as superior battery life, excellent system performance and reliability. The new Intermec CN51 has been designed specifically for the mobile workforce. Rugged enough to withstand the rigors of any environment but still compact and feature rich to keep you connected to the resources you need, the CN51 provides a superior user experience. For any business that relies on mobile workers, having the most capable tools in their hands ensures the success of any application. Intermec, now part of Honeywell, announced the CN51 rugged mobile computer – the company’s latest offers unparalleled versatility allowing the choice of Windows or Android operating systems on a single device coupled with a power-packed 1.5GHz dual core, multi-engine processor design with 1GB RAM, and 16GB Flash for the highest degree of future-proofing capability. Perfect for an array of applications: direct store delivery, transportation and logistics and field service operations. The CN51’s large, multi-touch, outdoor-readable screen provides ample room for application viewing with less scrolling for greater productivity, as well as more space for capturing signatures. It’s also equipped with state-of-the-art smart battery technology, delivering industry-leading battery life that lasts through a full 12-hour shift and beyond without interruption to replace or recharge. The CN51 is also the perfect migration option from the current CN50, offering improved processor and area imager performance, while still maintaining accessory compatibility with existing CN50 installations.